U.S. Senator and Democratic presidential hopeful Bernie Sanders says he won't make the same mistake as the Clinton campaign did in 2016, and assume the battleground states of Wisconsin, Indiana, Michigan, Ohio and Pennsylvania will swing Democratic in 2020. President Donald Trump won all five states in 2016. Sanders made campaign stops in Wisconsin and Indiana on Friday, followed by stops in Coopersville, Michigan and Warren, Michigan on Saturday. 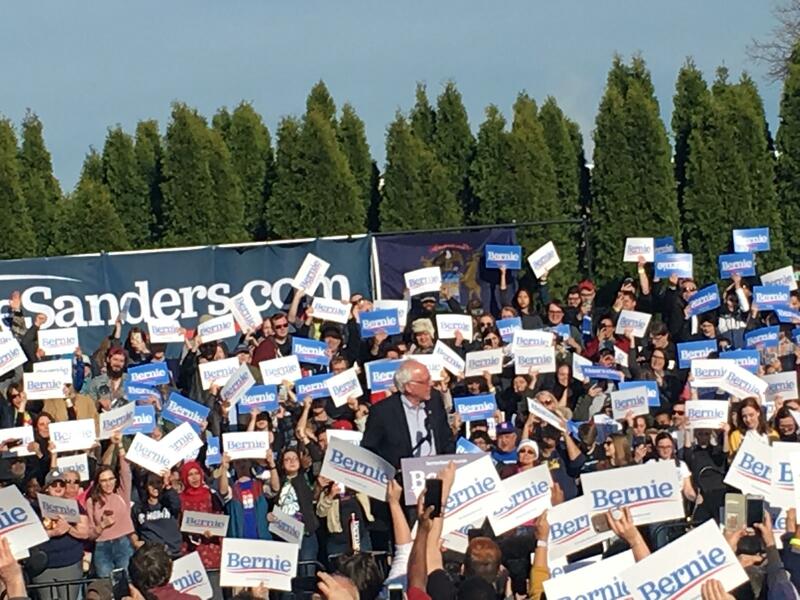 Sanders told a crowd of hundreds at Macomb Community College Saturday evening that he plans not just to beat Trump in 2020 - but beat what he called "Trumpism" itself - the growing political power of corporations and the ultra-wealthy in the U.S. He called the president a liar for pledging to protect Medicare, Medicaid, and Social Security and health insurance for everyone while on the campaign trail, then proposing to cut the benefits once he was elected. Sanders says if elected, he'd push for Medicare for all, expanded Social Security, and free public college tuition. He'd do that with revenue from raising taxes on corporations like Amazon, which paid no federal income tax in 2017, as well as on extremely wealthy individuals, like Amazon owner Jeff Bezos, Berkshire Hathaway CEO Warren Buffett, and Microsoft founder Bill Gates. Sanders says it's not right that Bezos, Buffett, and Gates own more wealth than the bottom half of U.S. citizens. "Yeah, we are going to ask the millionaires and billionaires of this country to start paying their fair share of taxes," he said. Sanders also said it's time to rein in military spending, stop unnecessary wars, and address climate change with ambitious policies to eliminate the use of fossil fuels. Sanders will next visit two other battleground states that Trump won in 2016 - Ohio and Pennsylvania. U.S. Senator Bernie Sanders was in Michigan Thursday to campaign for Democratic presidential nominee Hillary Clinton. He crisscrossed the state with stops in Dearborn, Ann Arbor, East Lansing and Grand Rapids.